“What size lathe have you got?”…..should I really have picked up that 16” ash blank. Never been one to pass up a challenge, I just hoped I could do that lovely piece of ash justice. Mounted outbound on a face plate, I quickly discovered the first challenge…..great though Steve’s wood was, it wasn’t the same thickness across the blank. Spinning up an out of balance piece of wood this size would be asking for trouble. Carefully sawing off the angles to balance the blank did the trick, check the RPM and off we go. 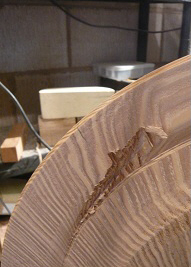 A few minutes with the bowl gouge and the real beauty of this ash began to show. Initially turned to a rather large porridge bowl, a remodelling was clearly required. A recess (to be disguised later) was added to the base and the whole underside sanded down to 600 grit using the Sorby Power Sander…..all going well so far. Applying sanding sealer 50/50 thinned really emphasised the colour of the grain. Having read a chapter in Robert Chapman’s book on turning, I was inspired to add a little detail to the inside of the bowl. Robert urged caution as dig ins could occur if you’re not careful. Again up for a challenge, I thought I’d have a go, the quality of the wood warranted that extra effort. Trying to add that nice bit of detail and Robert’s prophesy came true….the most monumental dig in you could imagine. Even my wife came in from the kitchen to find out what was going on. As I was working near the rim, there was no depth of wood….the dig in had burst through the other side. The chuck recess was damaged. The only bonus was that the bowl didn’t fly across the garage and smash into the wall. Back onto the faceplate to take out the damage and reshape the recess. I reshaped the bowl as previously, albeit a little smaller….now down to around 12”. Including a raised lip on the bowl to add that desired detail (this time a little more carefully….I’ll not make that mistake again). Finished again to 600 grit and sealed with sanding sealer, it looks the part once again….except. Although I’d remodelled the recess for the chuck, I should have turned a whole new recess from scratch. The photo left shows a major crack in the foot….another design opportunity in the making. I could now mount the bowl between centres and using the tail stock to support, turn off the damaged foot. 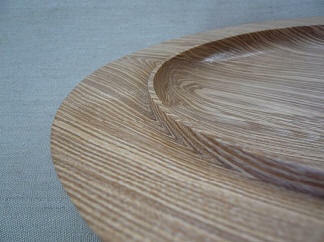 An offcut of Walnut was perfect to create a new replacement foot for the bowl. Turned to fit over what remained of the original foot, finished with sanding sealer then parted off using a thin parting tool. The new foot was then fitted to the bowl and fixed using medium thickness super glue. The underside of the bowl showing the foot. The ash grain is really quite something isn’t it? Below, the rim and on the right, the finished platter.